Engineers from Cybernet Systems took electric motor technology to higher quality and performance levels. 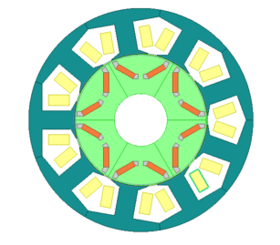 Using Optimus they optimized the design of an electric motor with interior permanent magnets (IPM) for maximum drive torque and minimum noise and vibration. Optimus enabled them to drive ANSYS® magnetic/structural simulations in exploring the design space and optimize the motor design. This new and innovative approach opens up opportunities for IPM synchronous electric motors used in (hybrid) electric vehicles, compressors and appliances. The results of the multi-objective optimization are impressive: drive torque went up by 7%, while lowering cogging torque by 35%, and acoustic radiation by almost 6dB.